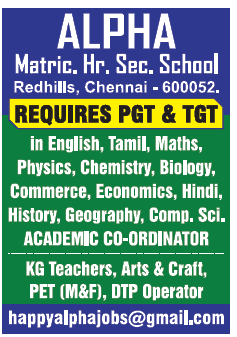 Alpha Matric Hr Sec School, Chennai has advertised in THE HINDU Classified newspaper for the recruitment of Teachers PGT / TGT / PET / KGT / Academic Coordinator Plus DTP jobs vacancies. Interested and eligible job aspirants are requested to apply immediately from 07th October 2018. Check out further more details below. About School : Alpha Matriculation Higher Secondary School, located in a scenic environment on the Velachery – Tambaram Bypass road, comprises Grades III to XII. The school began functioning on the 16th of June 2004 with around 100 students and 10 teachers. The Higher Secondary section was introduced in the academic year 2011-12. The Institution has also won many awards and accolades for providing quality education beyond the limitations of Matriculation syllabus and for introducing International dimensions to school curriculum. In the academic year 2017-18, middle school students of Alpha Matriculation Higher Secondary School will have an opportunity to join the CBSE stream offered by Alpha. How to Apply: Interested and eligible candidates are requested to send application along with CV, copies of certificates and recent PP size photographs to the following postal address or email address.